Did your dealership pay a visit to the iconic Mirage hotel and casino on The Strip in Las Vegas for Digital Dealer 25 this year? If so, odds are that you came away with a new perspective on how to navigate the sometimes tumultuous – and always changing – waters of the new seas of modern search thanks to Remora President and Chief Executive Officer (CEO) Christian Jorn and the Remora team who manned our booth for the latest installment of this can't-miss industry event. For those of you who didn't have the chance to attend Digital Dealer 25 this month or weren't able to stop by for a visit with the Remora crew while you were on site, don't worry; we have you covered with a complete recap of everything you missed, including a full playback of the exclusive presentation by our own Christian Jorn, "The New Seas of Modern Search: Advanced SEO for Bulk Lead Creation." From covering the science behind building a technical advantage with your dealership's website via powerful tools like query-string-free URLs to the inside scoop on how to beat the classifieds on search engine results pages (SERPs) across Google, Bing, Yahoo, and the rest of the search landscape, Christian offered up an expert look at the cutting edge of the online automotive marketplace. The best part about this powerful look into the realities of modern search? With real-life examples leading the way and actionable insights aplenty, Christian's presentation skipped all of the filler found in the offerings of other exhibitors and jumped straight to the hard-hitting facts that can truly make a difference for your car dealership. The man of the hour, Remora's own Christian Jorn, offering up insight into how dealerships can create their own technical web advantage in the modern SEO landscape. Of course, unloading a veritable mountain of insight into the realm of modern search engine optimization (SEO) and covering the tools your dealership must leverage to take advantage of this environment isn't the only way the Remora team made a splash in the Entertainment Capital of the World. Our crew also helped attendees unwind a little bit on the conference floor with a unique booth experience. Foosball (including a special guest appearance from one of the conference's more unusual attendees), Rubik's cube speed solving competitions, and plenty of other good times were waiting for those who made their way over to the Remora setup during this event. In other words, if you were out and about at Digital Dealer 25 and wanted to enjoy both the most insightful presentation on the docket and some lighthearted fun during your downtime, odds are you were hanging out with the delegation of Remora experts we sent to this year's event. If you are unfortunate enough to count yourself among those who missed out on all of the fun in Las Vegas at this year's edition of the Digital Dealer conference, or perhaps you simply want to revisit all of the impressive details offered up by Christian's official presentation, then you are in luck: As you can see down below, we've included a complete playback of this deep dive into the modern search landscape, as well as how your dealership can leverage this information to dominate the competition and regain top rankings from the classifieds in your local marketplace. After watching the playback of Christian's time on stage at Digital Dealer featured on this page, odds are that you have the same questions running through your head that the men and women in attendance at this industry gathering did: How can I build a technical advantage for my dealership in my local marketplace and when can I start? To get the ball rolling on this front, feel free to connect with the team of industry experts here at Remora. Our staff would love to dig even deeper with you into the process of ensuring that your dealership goes above and beyond competing dealerships (and the classifieds) and gets more than its fair share of sales. 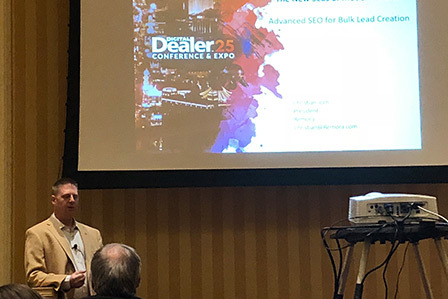 Finally, be sure to connect with us on social media or in the comment section down below to let us know what you thought about Digital Dealer 25 in Las Vegas, Christian's presentation on the changing dynamics of modern SEO for car dealers, and whether or not we'll be seeing your dealership at Digital Dealer 26 in Orlando, Florida, this coming April!